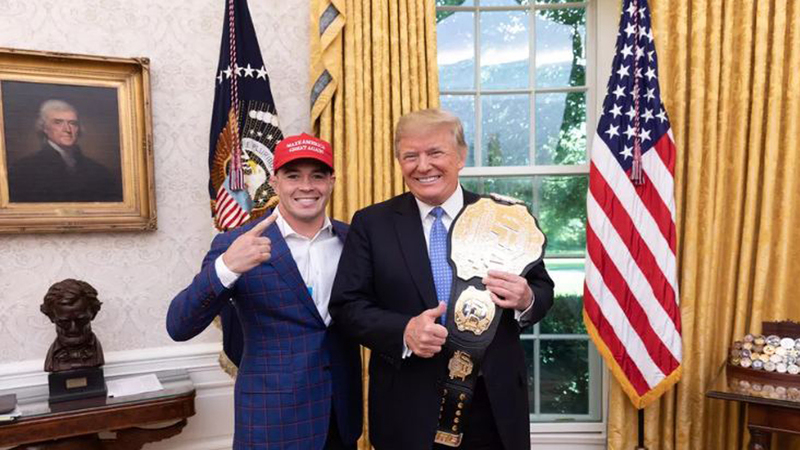 Home MMA News Surprise: Colby Covington Visited Donald Trump With Dana White In White House! Surprise: Colby Covington Visited Donald Trump With Dana White In White House! Colby Covington Didn’t Lie About Paying A Visit To The USA President! It looks like Colby Covington is a man of his word! Remember his promise after winning Rafael dos Anjos at UFC 225? He said he will go to Washington D.C. and hand his UFC Welterweight Interim belt over to the USA president Donald Trump. Well, a photo from his Twitter account proves he really did it. A man who threatened every MMA fighter, and even Joe Rogan! Take a look at him standing next to Donald Trump! The president holds the belt slung over his shoulder. President’s assistant, Don Scavino Jr, confirms that UFC president Dana White also paid White House a visit on Wednesday. Colby Covington hasn’t lost the fight since December 12, 2015. Chael Sonnen even said that the era of Colby Covington copycats is coming. One thing is certain – Chaos gained enormous popularity for a very short period of time. Do you agree with Chael Sonnen? Previous articlePic: Racist social media posts emerge from Cody Garbrandt but who leaked them?